I liked Solid Cafeteria Kway Teow Kia when I first tried it back in 2012. When I visited this popular Johor Jaya KTK shop again recently, I realised that I liked it more than ever before. I used to find its KTK stock a bit "medicinal" but now I found it just nicely savoury sweet with subtle herbalness. The layout and set up of Solid Cafeteria didn't changed much, if at all, during the last 6 years. It's a large restaurant, spanning two shop lots. 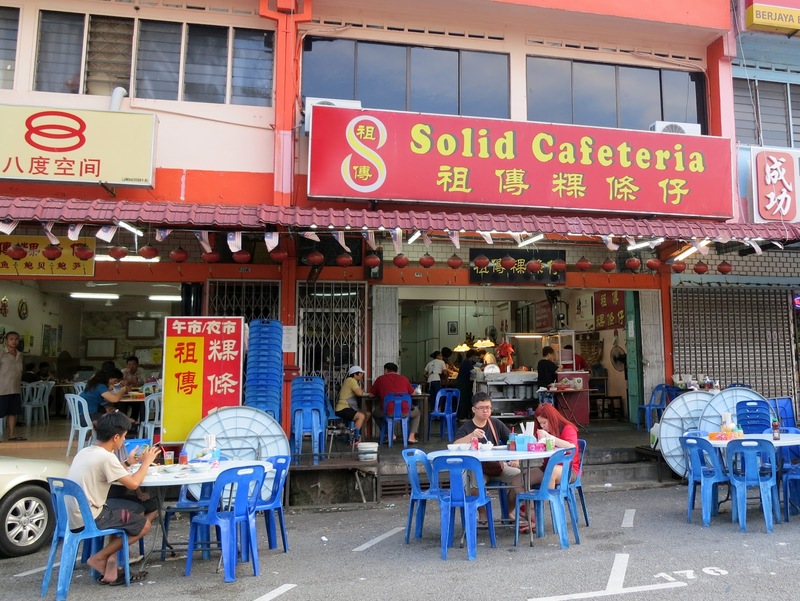 Solid Cafeteria was the third stop of our whole day kway teow kia trail (don't be like us - we were trying to find the best KTK in JB, so you don't have to waste time and calories 😄 ). As we were already quite full, we were light handed in ordering. After all, Solid Cafeteria wasn't very high on my KTK list based on past experience. Oh, how tonight changed my mind. 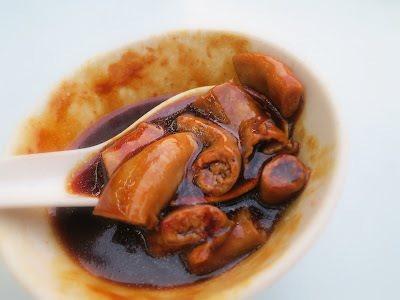 The pig ears, skin, intestines and belly were all nicely stewed. They were all tender but still retained their respective characteristic textures - pig ears had tender crunch, intestines were spongy, pork belly had three discernible layers etc. 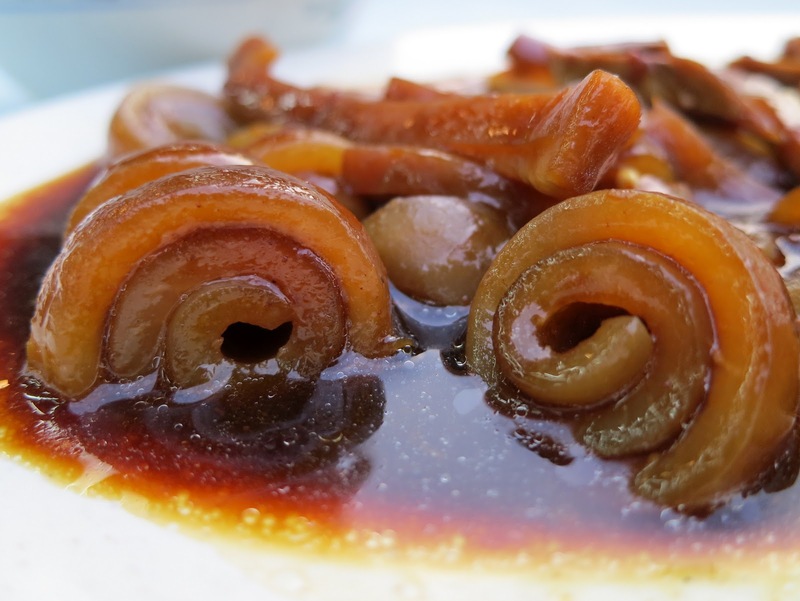 The stewed pig skin was a tender springy coil. Must order this. 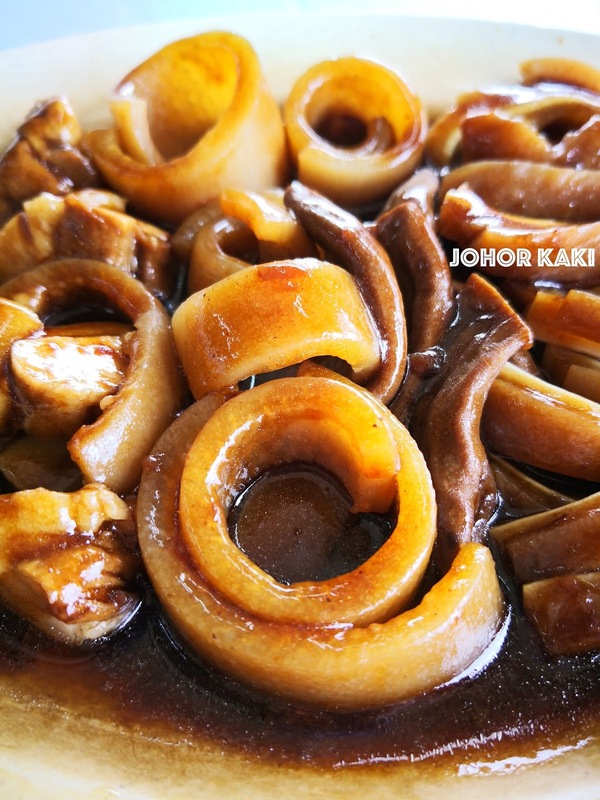 All the stewed pork were bathed and enveloped by the savoury sweet herbal stock which was thickened with starch. 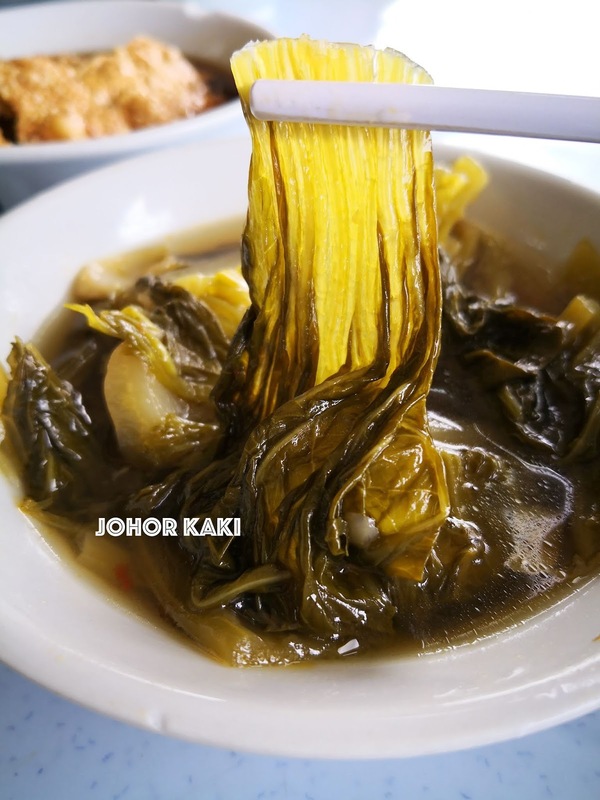 Solid Cafeteria is the only KTK shop that I know of in JB that thicken their stock. I think this is a great idea as more of the flavoursome stock cling to the pork. The thing is, the flavour of the sticky stock was just mild enough to allow us to taste also the natural sweetness of the pork. The house made stewed vegetable was limp but still had a bit of soft crunch. It tasted deliciously savoury tangy sweet garlicky. 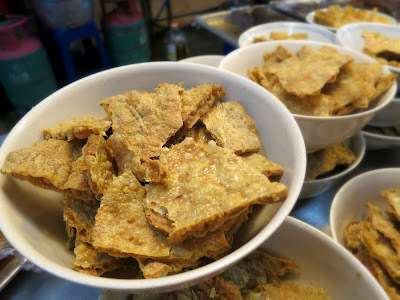 When at Solid Cafeteria, their fried tofu skin is a Must Try. The thick fried tofu skin sponged up loads of savoury sweet herbal stock yet it still had some soft crunch left. Lovely. It's like soaking up coffee with a cream cracker - same idea, equally shiok. 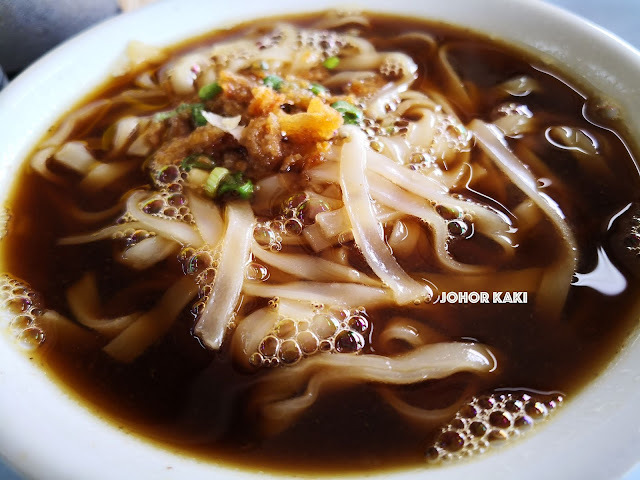 One of the best kway teow kia noodles now with silky smooth soft texture and slurpy delicious savoury sweet herbal flavour. 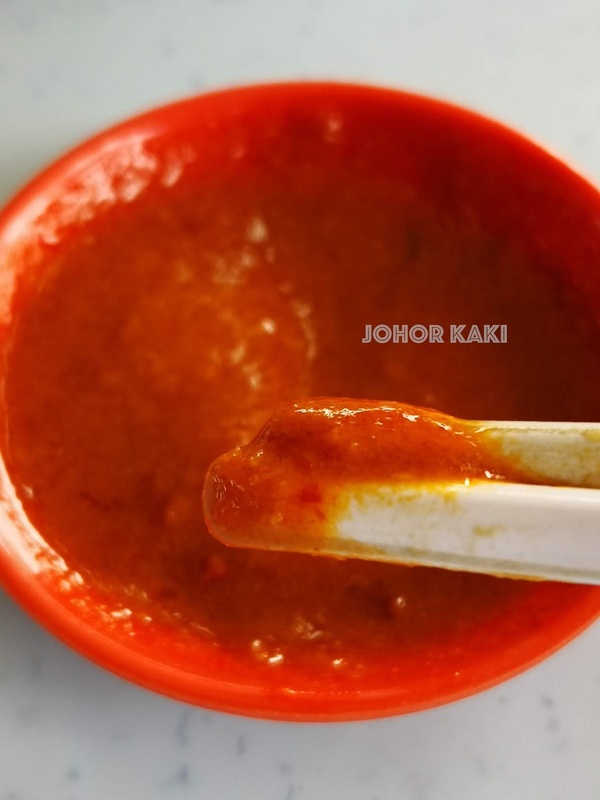 Solid Cafeteria's chili sauce is also a cut above - garlicky with a sharp spicy hot sting. 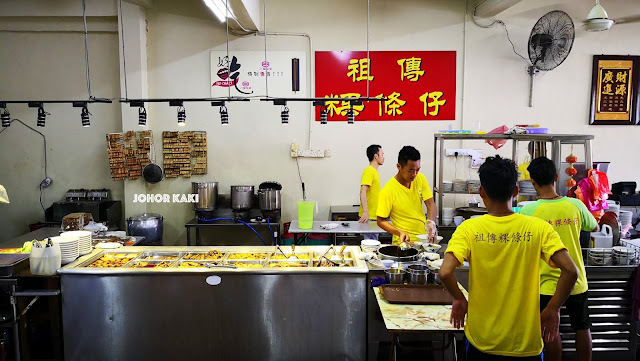 👍 I am so glad to be back at 祖传果条仔 Solid Cafeteria Kway Teow Kia after six years - I like it more than ever and it is one of favourite KTK now in JB. 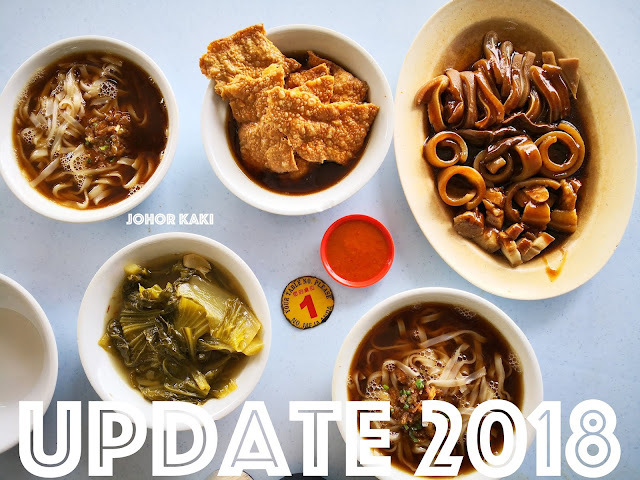 I have a long backlog of good food stalls in Johor that I have visited and liked, but have not yet blogged about. Once in a while, there comes a stall I liked so much that it jumps to the front of my blogging queue. 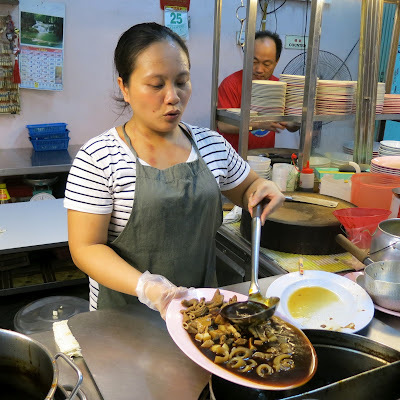 Solid Cafeteria kway teow kia 祖传果条仔 is one such outstanding stall. 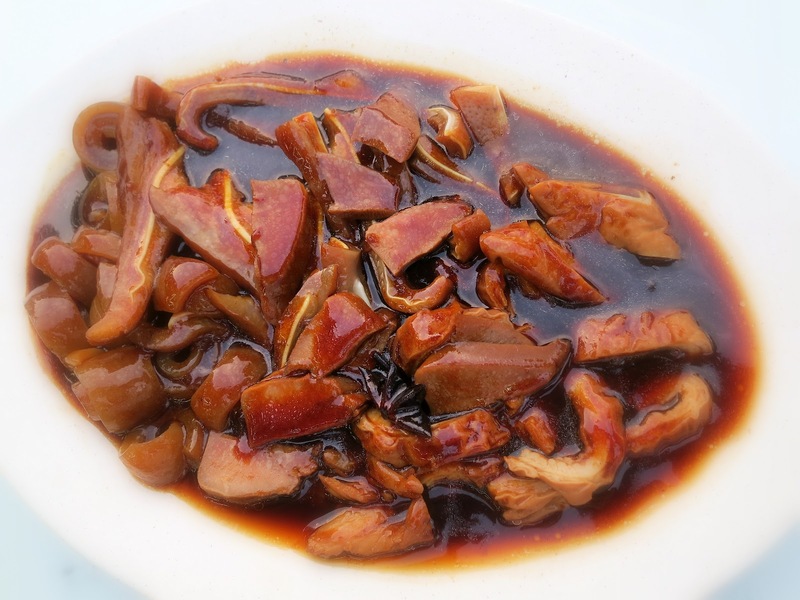 Solid Cafeteria's pork offal were very well prepared. They were all very well cleaned, braised till tender yet still al dente, while retaining the pork's natural sweetness. Just one example. Look at the braised pork skin. It was curled into a springy coil because the skin was braised just right. But the same can be said of the pork offal of many of Johor's best kway teow kia stalls. 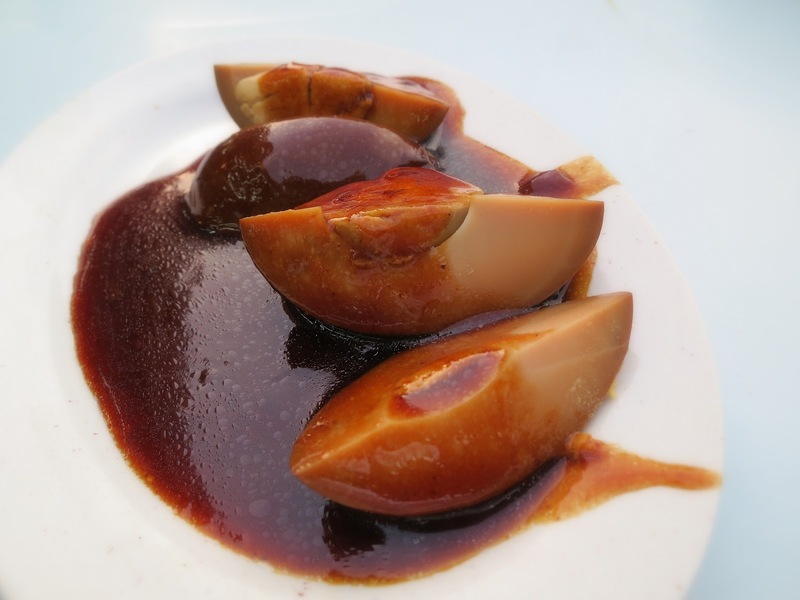 The thing that really sets Solid Cafeteria 祖传果条仔 well apart from the rest is their special gravy. At Solid Cafeteria, the pork offal were drenched with a dark, gooey, syrupy herbal gravy instead of the usual light herbal broth found elsewhere. 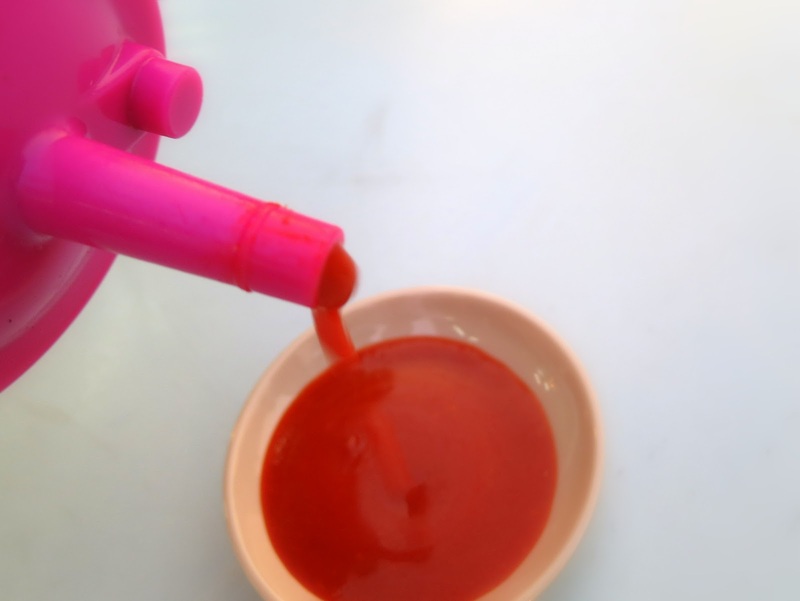 Solid Cafeteria's gooey gravy is silky smooth, delicately herbal and with pleasant sweet notes. It is easy to fall in love with (or is it get addicted to?) 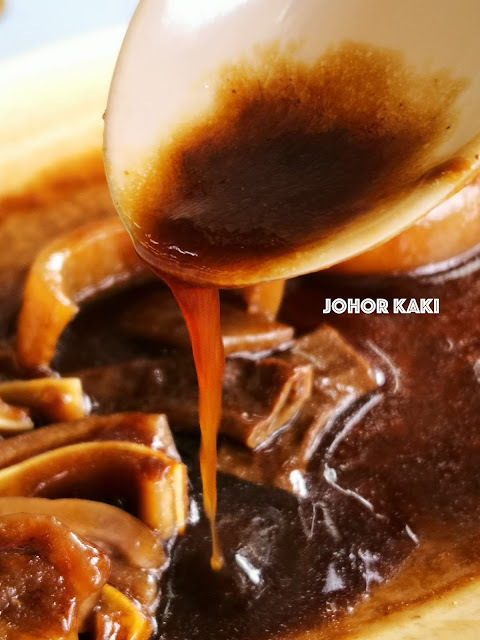 Solid Cafeteria's flavourful, savoury herbal gravy. The distinctive flavour and taste came from brewing many blended herbs together with lots of large stock bones for hours. 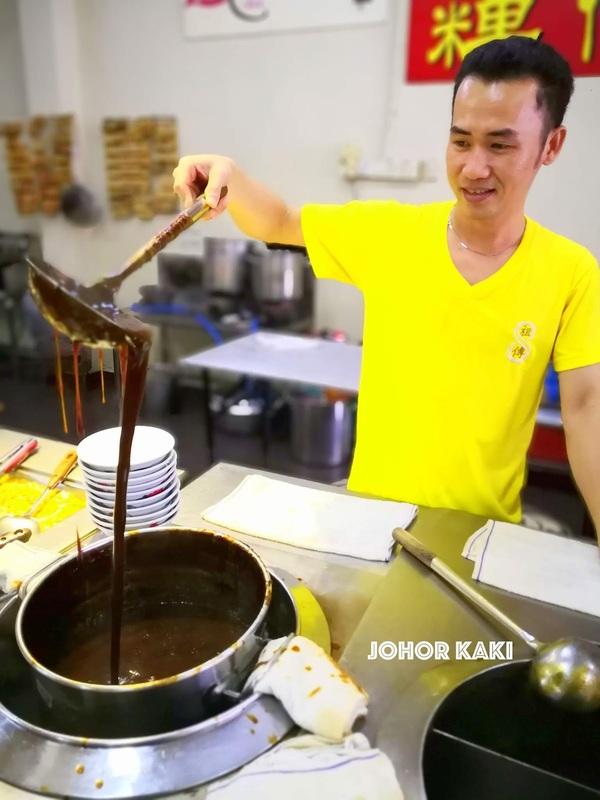 The owner MR Ong said the traditional recipe came from his mother which he later modified and improved upon. Solid Cafeteria's signature gravy is so good, I am sure I would be perfectly happy to eat at least a bowl or two of plain white rice with just the gravy alone, and nothing else. I fact, I found myself slurping up all the gravy after cleaning my plate of pork offal. It was that good. 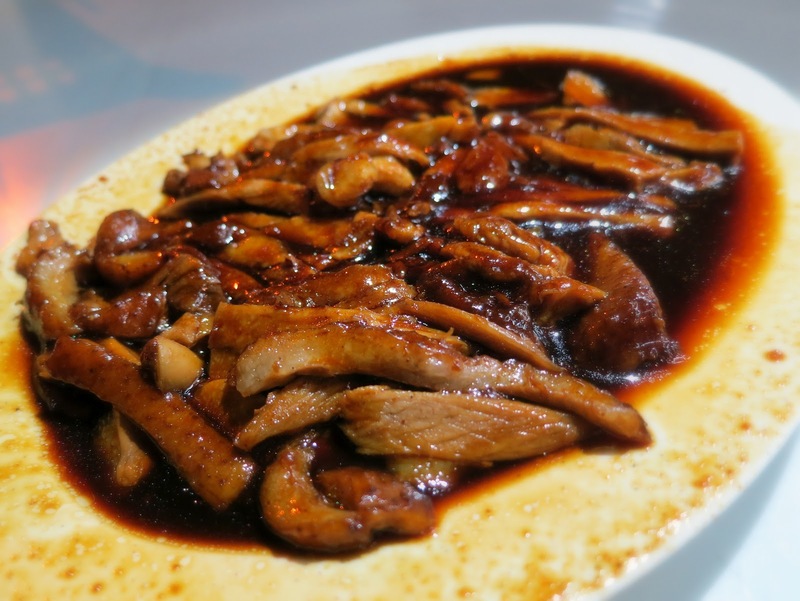 Solid Cafeteria is also famous for their signature braised duck. The slices of tender and naturally sweet braised duck meat were flooded with generous amounts of the same signature herbal gravy, that overflowed over the sides of the shallow plate. The chili sauce was excellent too. Fresh, tangy, spicy hot and sweet. I must remember to order these fried bean curd skin during my next visit. They look perfect for soaking up Solid Cafeteria's unique herbal gravy. The braised pork skin looks good.... and so pretty too, the way it curls up. Yes, I tried and blogged about Meng Fang too. It was also nice and I liked it too. Meng Fang is the more traditional type. This one at Solid is a more experimental (new) type. Actually, I admire Solid's boss for daring to take the risk and deviate from tradition. I thought he create a taste that did rather well actually. Wow! 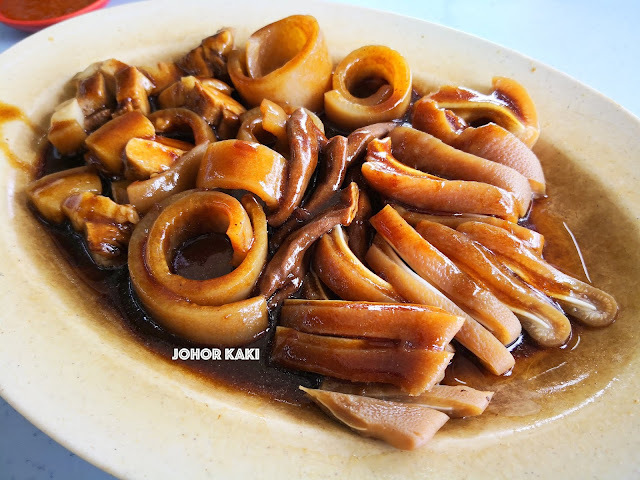 You actually tried this place out after I had recommended it in you Taman Tasek kuey teow kia post. I am glad that you liked it! Next time try the tofu skins. It is crunchy and soggy at the same time with the taste of the herbal soup. 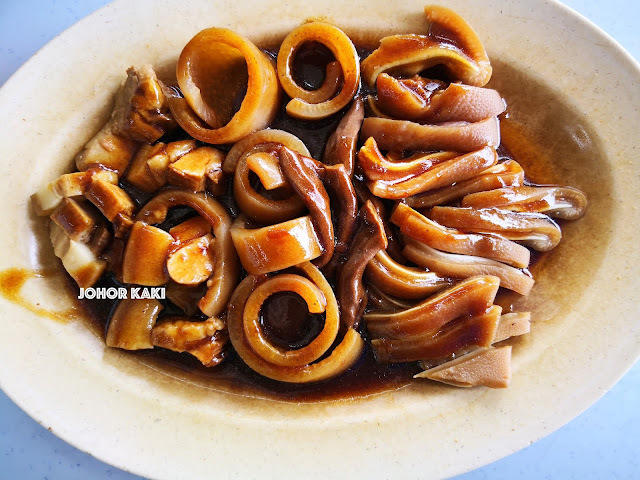 Oh, try the dry version of the kuey teow. It's something new as well. I saw that you don't have many posts on JB Japanese restaurants. 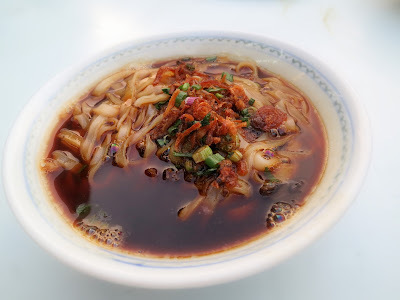 My favorites are Kura which is at the shophouses going towards Crystal Crown Hotel from town center and Kirishima in the actual Crystal Crown Hotel itself. One is shi fu, and the other is du ti. Another favorite is Nijyumaru at the Permas Jaya branch, not the Sutera one. 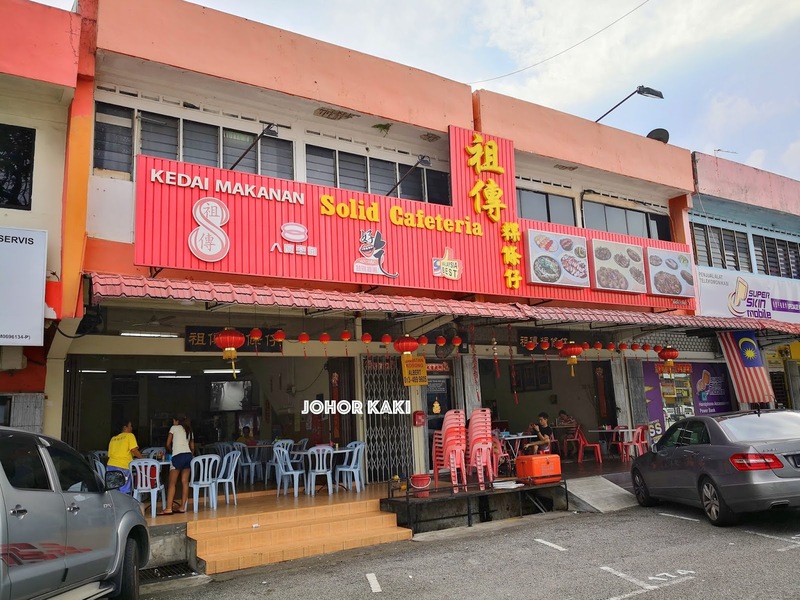 These I think are the better Japanese restaurants in JB. 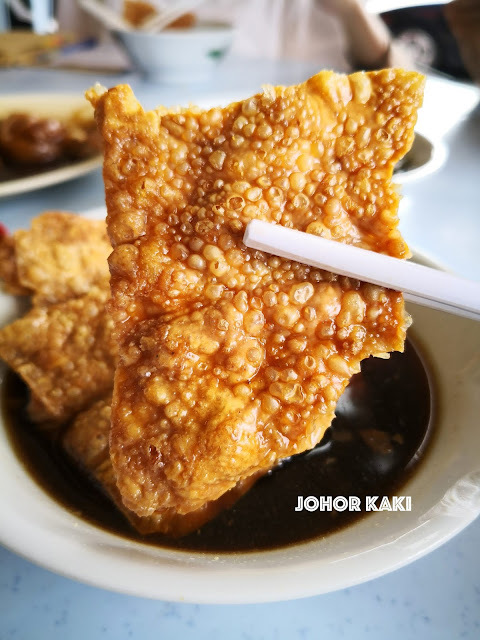 Run by group malay gangsters who shouted at me after i ask them to break down my $40 bill.i ordered 1 small fried tao kee, medium plate intestine, 1pc belly, 1pc pig's maw & 3bowls of kway teow. Forced to settle at $30.